3D printing is on the verge of revolutionising the way we shop … or don’t shop. Not only will we not have to go to the high street to pick up items, we won’t even have to go to Amazon. With a couple clicks of the mouse, you’ll be able to print all sorts of basic products in to existence, with the complexity increasing as the technology gets more refined and more accessible. But what about Ice Cream? Ok so you may be wondering what exactly printing ice cream means. It already comes swirling out of a machine, what’s the difference? 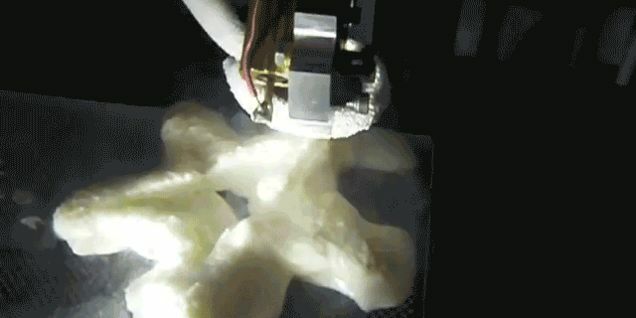 Students at the Massachusetts Institute of Technology (MIT) have modified a 3D printer to produce ice cream in any shape! That’s one of the key innovations of 3D printing technology. Machines have made things (or helped us make things) for centuries, but the layering and precision of these modern contraptions are allowing us to quickly and efficiently build anything from guns to houses … and now gun or house shaped ice cream! Kyle Hounsell, Kristine Bunker and David Donghyun Kim, created the ice cream printer as part of an MIT graduate project for the additive manufacturing department. Essentially they hooked up an existing 3D printer to an existing Mr Whippy-style ice cream maker, and made their own modifications. The cooling was accomplished by utilising liquid nitrogen as the ice cream mix left the printing nozzle. This froze it in to the required shape. Of course at the current time this is more of a proof of concept, than a fully functional piece of technology, but the students envision that a more refined version of their 3D ice cream printer could end up at fast foot outlets and ice cream parlours like Dairy Queen. Consumers could potentially make their own customized treat, or the franchise could simply offer a range of unique shapes to choose from. Eventually it could even wind up as a common kitchen appliance. Children’s birthday parties would certainly benefit. While 3D printing is exciting a lot of people, we’re still a long way off from every household having one beside their desktop. Initially its going to be a large scale manufacturing innovation, where factories and plants utilise it for the products they already make. Then perhaps you’ll be able to go to a local shop and get something made to order. Only when software and price makes it accessible to the average consumer, will we be printing our own clothes, cutlery, and sugary treats.